Bauer K. Jack. The Mexican War, 1846 - 1848. Macmillan, 1974. Meed, Douglas. The Mexican War, 1846 - 1848 (2003). A short survey. Bauer K. Jack. Zachary Taylor։ Soldier, Planter, Statesman of the Old Southwest. Louisiana State University Press, 1985. Albert J. Beveridge; Abraham Lincoln, 1809 - 1858. Volume: 1. 1928. Brack, Gene M. Mexico Views Manifest Destiny, 1821 - 1846։ An Essay on the Origins of the Mexican War (1975). Graebner, Norman A. Empire on the Pacific։ A Study in American Continental Expansion. New York: Ronald Press, 1955. Graebner, Norman A. «Lessons of the Mexican War.» Pacific Historical Review 47 (1978)։ 325-42. Graebner, Norman A. «The Mexican War: A Study in Causation.» Pacific Historical Review 49 (1980)։ 405-26. Pletcher David M. The Diplomacy of Annexation։ Texas, Oregon, and the Mexican War. University of Missouri Press, 1973. 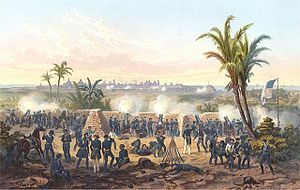 Price, Glenn W. Origins of the War with Mexico։ The Polk-Stockton Intrigue. University of Texas Press, 1967. Schroeder John H. Mr. Polk’s War։ American Opposition and Dissent, 1846 - 1848. University of Wisconsin Press, 1973. Sellers Charles G. James K. Polk։ Continentalist, 1843 - 1846 Princeton University Press, 1966. Weinberg Albert K. Manifest Destiny։ A Study of Nationalist Expansionism in American History Johns Hopkins University Press, 1935.